The practicePRO program provides risk management, claims prevention and law practice management information to Ontario lawyers. Its resources, precedents and checklists are intended to help Ontario lawyers take proactive steps to avoid legal malpractice claims and grow successful and thriving law practices. The practicePRO program is a claims prevention initiative of the Lawyers’ Professional Indemnity Company (LAWPRO). LAWPRO is the professional liability insurer for Ontario lawyers and is wholly owned by the Law Society of Ontario. This brochure has a collection of our best claims prevention tools and resources. In 1997, work began on a risk management program to complement LAWPRO’s success at claims management. At that time there was recognition that the practice of law was becoming more complex and that emerging technologies were driving significant changes. LAWPRO’s actuarial data was examined to see how claims were affected by such factors as area of law, years in practice, geography, and firm size. Added to this mix where the findings of a report by Professor Neil Gold, former dean of law at the University of Windsor. The data and findings were clear, the underlying causes of the majority of claims were lawyer-client communication and relationship problems, and poor time and file management. See this [article on the most common causes of claims] for a detailed analysis. Information to help lawyers understand where and why claims happen: The first pillar focuses on bringing lawyers the latest information on claims and claims prevention. 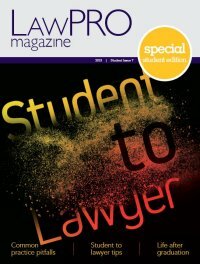 Information is delivered through a variety of channels, including LAWPRO magazine, the practicePRO website, webzines, Claims Fact Sheets, live presentations, and social media. Practice Aids to help lawyers reduce their claims exposure: The second pillar is “how to” tools and resources to that would help lawyers address the issues that are causing claims. There is an extensive collection of checklists, precedent or template documents, sample retainers, toolkits and “Managing” series of booklets, and others, available for download on this website. Our lending library makes more than one hundred books on a wide variety of topics available for free loan to Ontario lawyers. Education by outreach through CPD programs: The third pillar focuses on delivering information on claims prevention to lawyers via CPD programs and other live presentations. The practicePRO program has fostered a close working relationship with CPD providers to accomplish this. LAWPRO’s Risk Management Credit serves to encourage lawyers to attend CPD programs that include content on risk management and claims prevention. Promotion of wellness and balance: LAWPRO’s claims experience shows that stress and personal or health related issues (e.g., addictions) are a contributing factor to many claims. The practicePRO program promotes wellness and encourages lawyers to manage stress and achieve a healthy and balanced lifestyle. Together with the Law Society of Upper Canada, LAWPRO provides financial support for the Member Assistance Program or MAP (myassistplan.com). Through Homewood Health, the MAP provides Ontario lawyers, law students, licensed paralegals, and their families with information and services that help achieve health and wellness goals. The evolving face of risk management: practicePRO in the next 15 years.